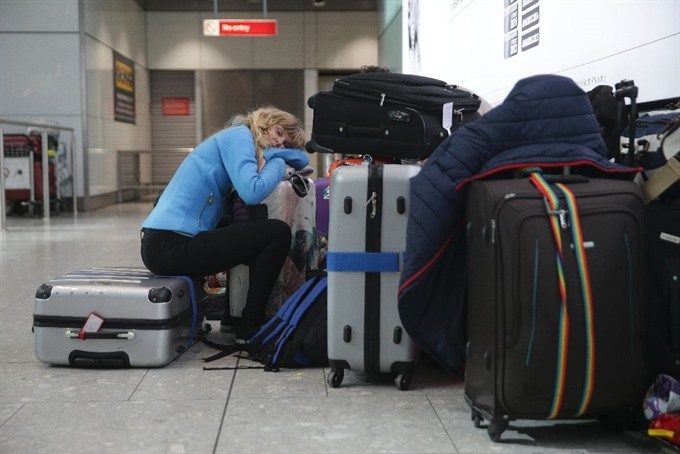 LONDON — Thousands of travellers faced further chaos on Sunday as British Airways cancelled more than a hundred flights from London’s Heathrow Airport following an IT system failure. Around a quarter of Sunday’s flights set to depart from London’s major hub before 10.00pm (2100 GMT) were cancelled as the airline battled to contain the "knock-on disruption" to schedules, with aircraft and crews out of position around the world. British Airways said it was hoping to operate a near-normal schedule of flights from Gatwick, London’s other major airport, and the majority of its Heathrow services. BA cancelled all its flights out of the two airports on Saturday after the IT failure, which shut down all of the carrier’s check-in and operational systems and affected call centres and its website. BA’s outage came on a busy weekend in Britain, where Monday is a public holiday and many schoolchildren are beginning a week’s holiday. An AFP photographer at Heathrow’s Terminal 5 on Saturday said many travellers were waiting outside the departure area with their luggage in "chaotic" scenes. She said that flight was cancelled, and another flight she rebooked for Sunday was also cancelled, while there was no sign or news of the couple’s luggage. "British Airways has ruined our honeymoon," she told Sky News. "They’re not helping us at all."